Corporate social responsibility (CSR) refers to business practices that involve participating in initiatives that benefit society. CSR has considerably more impact for small/mid-size businesses than just the direct benefit to the community and the environment. Not to downplay those key outcomes, but in addition to the community paybacks there is increased interest from customers, employees and job seekers in companies’ community involvement. One significant benefit to companies that demonstrate sustained levels of CSR is competitive differentiation in the marketplace. One comprehensive, international study reveals some key facts as it relates to CSR and the overwhelming upsurge in consumer attraction it generates. Consider these consumer reactions to companies that engage in CSR. Clearly, these findings speak volumes on the influence of CSR not only on consumer behavior, but corporate reputation as well. As a matter of fact, 9 of 10 reported they were likely to switch brands to a company associated with a good cause, given comparable price and quality. Mark Smith is an entrepreneur who built a business plan around doing good. Smith owns 4 Midas franchises in Central Virginia. With an impressive infusion of creativity and high energy, he has leveraged his business services with inspiring payback to Virginia Blood Services (VBS) and FeedMore. Click here. Read the stimulating story of his major accomplishments in serving the community while creating synergy for his business success. Click here for the full story as reported in RVA News. 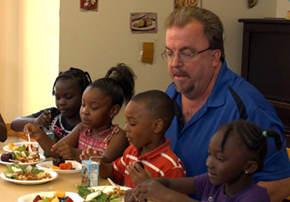 Smith firmly believes if your heart doesn’t own an issue, your head never will, so we are totally invested in FeedMore and VBS, and a,, the good they do for Central VA.
Here’s a quick overview of Mark’s major contributions to CSR and the net effect on his business. Smith’s initial thought was to sponsor a blood donor drive at his shop. Every donor would get a free oil change. It proved successful, bringing out 26 people in contrast to the average VBS drive yielding 18 blood donors. “Now we have 400 people show up”,Smith said about the last Midas blood drive. That’s why nearly 2 percent of the region’s blood supply comes from Midas. “I give away 2,000 free oil changes through VBS a year,” Smith said. With oil changes at $40.99 a piece, Smith does over $81,000 in free oil changes annually. Smith’s stores don’t only pump out blood. They also work with FeedMore (Smith is a former board member), and freely distribute coupons for free oil changes to local nonprofits and schools that, in turn, sell them to raise money. But the metric he uses to gauge that growth isn’t in oil changes or revenue. He talks about growth in the currency of good. “This year we’re going to give $130,000 – $140,000 to FeedMore,” he said. “I’d like that to be $200,000.” He doesn’t want 400 blood donors to come out for the next drive. He wants 500 donors, even 600! Motivated to consider weaving community service into the tapestry of your business plan? If so, here are some key considerations. Passion: Support programs that match or complement your business as well as your personal desires to do good. Caution: Think twice about involvement in polarizing issues. Your goal is to be a unifying force not a divisive controversial character. Choose a Sustainable Effort: You will give and get far more benefit, per foot-pound of energy, by contributing to ongoing, sustainable projects. For example, initiatives that are recurring on a frequent schedule are far more visible and deliver more power for the CSR provider than a stand-alone annual event. Define Community: It’s not just your customers, prospects and referral sources that make up your community. Other stakeholders include other businesses, local government and not-for-profits – all of whom will take note of your community involvement. Build Relationships: The object of the exercise is to expand your presence in your community to enhance your span of contacts. Spearheading or actively participating in CSR projects offers the opportunity to connect as peers with the movers & shakers in your community in causes you both support … such connections are often difficult or impossible to forge in a typical business environment. Involve Employees: Inviting participation by employees yields a three-way benefit structure. First, it provides more hands-on-deck for the project. Second, the community benefits from added value delivered in time and money to the CSR initiative. Third, the employer enjoys enhanced employee morale, productivity gains and teambuilding. Toot Your Horn/Marketing: When you support an initiative you believe in plus offer a quality product or service, that’s a marketing recipe in the making. Advise present and past customers, key prospects and referral sources what you are doing. Additionally, issue press releases, post CSR activities on your website, write blogs, let people know the $ amounts and volunteer time value your efforts are yielding. Don’t be arrogant … and don’t be bashful. Go for it! Word of mouth has gone digital. Capitalize on the multiplier effect of electronic communications and social media broadcasts. Many others have melded community service and commercial goal achievement. It’s not a new idea … click here to view what the Harvard Business Review had to say as part of a live video interview.